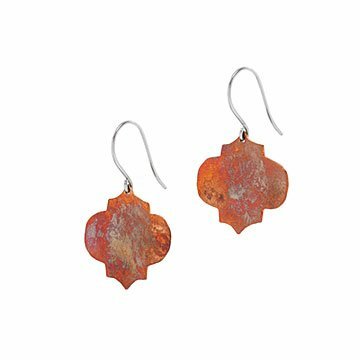 Sarah Daigneault chromatically "paints" the copper of her handmade Moroccan motif earrings with fire. The iridescent surfaces of Sarah Daigneault's Moroccan arabesque earrings are created not by paint or dyes: they're "painted" with fire. After hand-cutting the shapes from solid copper sheets, Sarah files, sands, and tumbles them to a smooth polish. Then she skillfully touches a torch flame to the copper, creating the beautiful chromatic effect. When worn, the bohemian-style earrings move freely on the handmade sterling silver wires, catching the light—and, perhaps, just the right amount of attention. Handmade in Pennsylvania. Sarah Daigneault has been studying and making art since her childhood in Maine, years before she began taking formal art classes at age eight. Over the course of her extensive schooling, she studied and practiced every medium imaginable: sculpture, drawing, painting, film, metalwork, photography, digital video, and graphic design among them. On her own, she began collecting and then reworking vintage jewelry, using the skills she’d learned in metalworking classes. She developed a love of jewelry making, and now her art and design background play a huge role in the planning and creation of her designs. Sarah now lives and creates in Pittsburgh, Pennsylvania. Gentle polishing cloth, do not expose to moisture.